I remember the impatience of Spring. I felt it first last year, when Spring was delayed by the weather. It snowed in April. Do you remember? The birds seemed to know somehow and kept safe in the south. When the weather finally warmed, they came in a rush. For three weeks in late April and May, a vast river of birds flooded the Fill. I remember sitting on my camp stool near the alder grove, counting the warblers. Counting and wondering what I was missing on Main Pond. Not able to sit still, I grabbed my stool and hurried to Main Pond. Sat there briefly, counting the shorebirds and wondering what I was missing in Surber Grove. I snatched up my stool and flitted off, feeling impatient. Feeling disconnected from nature, feeling wrong. Impatience is not why I go to the Fill. I go there to find serenity. The Fill is a refuge from the frantic demands of the other world, my culture. I don’t wear a watch when I go. I carry no cell phone. I hear no pleas from work, family, clock, or calendar. I am at peace. Until the impatience of Spring jolted me out of kilter. I felt it again this year, another late Spring, another held-up migration. Where are the birds? Temperatures fell into the 30s last night. It’s April 23. I feel impatient, and wrong. Again. 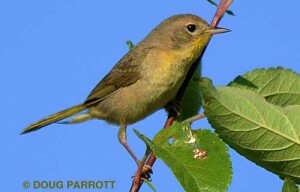 Until, that is, I saw a female Common Yellowthroat south of Main Pond. She had a wisp of grass in her bill, and she was in a hurry to find another. She had arrived only a few days ago, and yet eggs were clearly on the way. No time to waste. Must build her nest. Must raise her brood. It came to me that hurry is as much a part of nature as is the slow rotation of the seasons. There is a time for impatience. Now is the time. Seize the moment. Or as the sign my tenth-grade chemistry teacher taped next to his wall clock read: Time passes. Will you? This entry was posted in Uncategorized on April 23, 2010 by constancesidles.